By now you have all heard about the shooting in Arizona. Outside a supermarket Jared Lee Loughner shot a 9 year old girl, a church volunteer,judge, congresswoman, and fifteen other people. 6 of the victims were killed. Congresswoman Gabrielle Giffords was shot in the head but lived. Her recovery is being described as 'a miracle' by some. While I seriously doubt Giffords' recovery is a result of some kind of god taking action on her behalf, it is a rare thing to see someone recover from such an injury at all. Loughner was pissed at all kinds of things, not just the government. He was mentally ill.The illness had negatively effected his life for years. The people who lived around Loughner (who lived with his parents) said some had moved just to get away from the family. After the shooting several people pointed a finger at Sarah Palin and other republicans and blaming them, at least partly, for the shooting deaths. Sarah Palin has used terms associated with firearms in her political rhetoric. In fact it was easy to find the words 'cross-hairs' 'sight' 'fire back'. Giffords opponent, in the last election, even held an event “Help remove Giffords from office” by coming out with him to “shoot fully automatic M16s.” That's right, come on out and shoot an M16 to get rid of competition. For the record, I think people should be allowed to own guns. Background checks should be done to make sure the buyer is not a lunatic or a hardend criminal and a wait period should be in place. 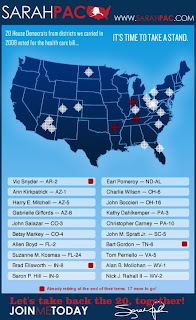 I do not believe it is fair to lay blame on tea-baggers or people like Palin for the shooting outright. intent on devouring the human race. I know it is happening on both sides but the Republicans seem to be the ones who are running around in masses unchecked without anyone to tell them when they have maybe gone a little too far. Stretching the truth so thin you can see through it so they can make a case that Obama=Osama. Criticizing the Democrats about every single thing they do, not because of legitimate concerns, just because. And not just finding fault but warning the American people that the Democrats are trying to destroy this Christian nation. Loughner was mentally ill and no one can say whether or not some of the rhetoric sprinkled with calls for a violent take-back helped him choose what actions he was going to take that day.....but... it could have. Those three words are what people need to be paying attention to. It could have. 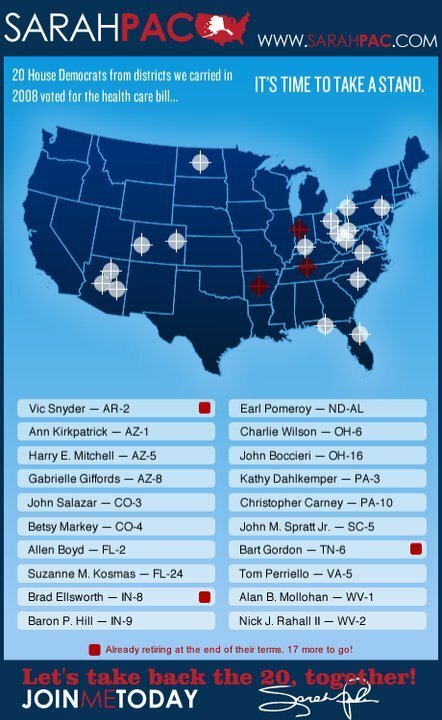 There is no need for people like Sarah Palin to use slogans like “never retreat, instead RELOAD!” Calling for people to join her in “a fight to elect people across the nation who will bring common sense to Washington,” accompanied by a map with cross-hairs on those states. Want to take a guess at one of the states included on that map? Like I said, I don't think it is fair to lay the blame for this shooting entirely on the Republicans, but, I find it ironic that Gifford had some of the same issues with Palin as I do back in March. Do we need to provide better mental health services for people in need of them? Damn right we do. Better services may not have stopped Jared but they would at least be some attempt to help people who can not help themselves. And we all know Sarah Palin needs some serious mental help don't we? One of the problems with this is the Republicans are not interested in trying to get any type of health coverage plan which covers all Americans. Even if we do get a plan in place they put having it repealed on the top of their 'to do' list. Nevermind the huge waste of time and effort which could be spent on countless other problems we face. It seems to be an attempt to 'save face' by Republicans. "If we could just shoot all the liberals, then all our problems would be solved." I'm seeing more of this now and I take it very seriously. I don't think most people want to kill liberals but it only takes one angry person with a weapon to make it real.